Cities Connection Project | A-PARK. ZURICH-ALBISRIEDEN. In the 1960’s a piece of land was left vacant for an express route. This was later donated to a cooperative for the construction of 60 affordable apartments and commerce. The ground floor of A-Park is a rich urban fabric of public use, transforming what had till then been the rural suburbs of Albisrieden into a new urban center. The two bent longitudinal structures define two exterior urban spaces of quite different character: through a low transept created parallel to Albisriederstrasse is an urban space, which serves as access to all the shop. A narrow passage leads to the more intimate, leafy courtyard. 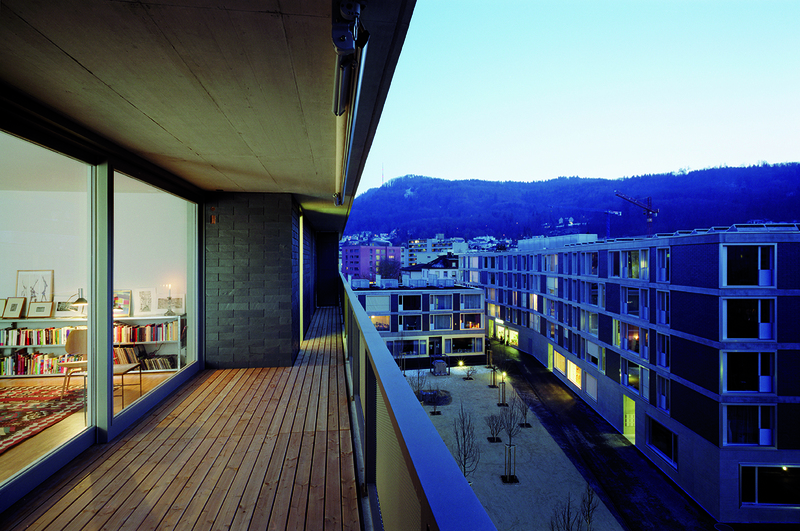 The courtyard offers an interaction area with playground, through which the apartment entrances are accessed. The majority of apartments are housed in the two main wings. They are characterized by an east-west orientation. 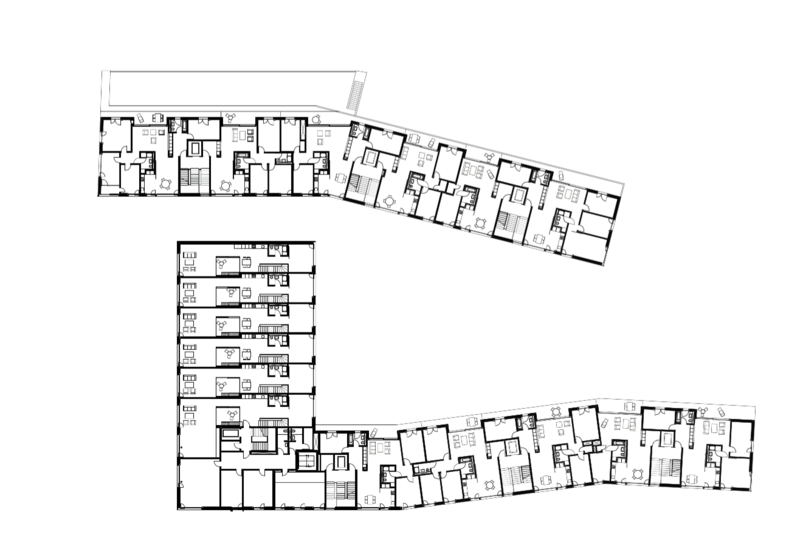 The aim of the floor plan was the creation of generous opening spaces, making the actual corridors superfluous and letting the compact floor plans appear generous. The living and dining rooms with separable kitchens are designed as continuous, light-filled living areas. Following their meandering shape, each room branches off and is put on display. In the lower transept there are six two-storey maisonettes. On the upper floor, the spacious living area and kitchen are structured around an atrium, from which a staircase leads to the private roof terrace. 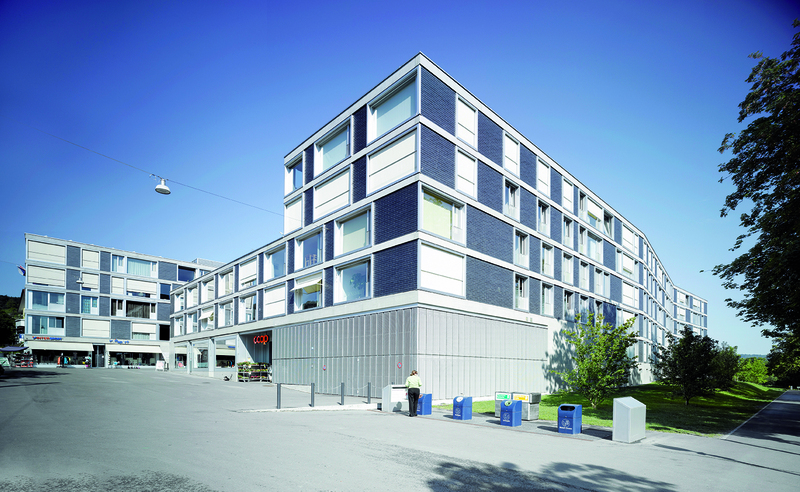 Horizontal concrete slabs envelope the building and divide the facades vertically, marking each storey. Large windows with aluminum frame are fitted into this rhythm giving an overall harmony to the facade. In contrast to the bright aluminum frames and the concrete elements, the closed outer wall parts have been covered with dark slate Porto.